During the social media presentation Scott Fitch has been asked to give nearly 500 times over the past three years, students hear terms such as digital footprint, cyberbullying and “Pause Before You Post,” the hallmark phrase trademarked by his employer, Jostens. But there’s one moment that grabs everyone’s attention in almost every jam-packed auditorium he speaks. It’s when Fitch says he did his homework and — after obtaining a class list of the students — he viewed some of their Instagram and Twitter accounts and even researched Facebook, the social media space teens have pretty much vacated because, let’s face it, there’s just too many adults there watching. The auditorium stirs. The kids react. Some hearts begin to race until Fitch, without flinching, reveals that he’s joking. “I’m not going there. Take a deep breath,” he says with a smile, as a collective sigh of relief washes over the room. “Were you worried?” Fitch asks. That’s just a snapshot of his presentation on social media peril and how it can cost kids their dignity, as well as a college scholarship. Fitch has been doing it for about four years. 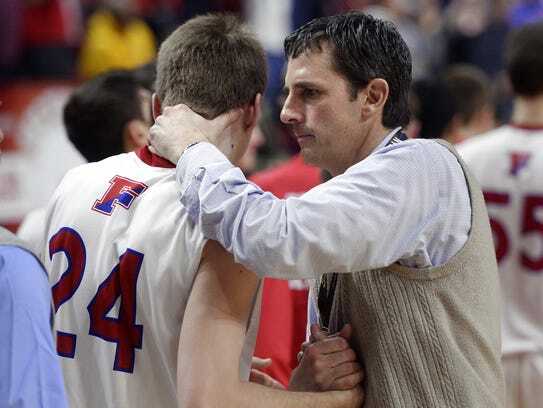 A Fairport (N.Y.) High graduate and former NCAA Division III Basketball Player of the Year at the State University College at Geneseo, Fitch is becoming as well-known for his speeches as he is as Fairport’s varsity basketball coach for 16 years. Ask your children if they’ve heard one of Fitch’s passionate presentations. They just might have. “You don’t even realize who is watching what you’re doing (online) and you really need to be careful what you post,” says Pittsford Sutherland sophomore Melissa Nixon, 16, who was in the audience when Fitch spoke to the entire freshman and sophomore classes for 35 minutes last week. Dominic Porto, a 13-year-old Bay Trail student, about Fitch’s talk? It was his anecdote about having a college coach several years ago tell Fitch he was no longer going to recruit one of Fairport’s top players because of something the young man had posted on social media. That’s really where this all started for Fitch, that lost scholarship, which happened about seven years ago. It spurred him to find out what his players were posting and he found out quickly he needed to educate himself so he could teach his players. His speaking career kind “morphed into a life of its own,” in 2014 and 2015. Fitch already had done about 40 speeches before being featured in a video and mentioned in a Democrat and Chronicle story in September 2014. After that, the country came calling. Fitch says schools from more than 10 states and as far away as California and the state of Washington have contacted him. To date, he has spoken in New York, Massachusetts and has a speech scheduled for Michigan later this year. That story has been shared more than 44,000 times on Facebook. Most of Fitch’s work is in the Rochester region, but the 46-year-old also has presented to Southern Tier schools, has plans to expand to Long Island this fall and has spoken to statewide groups of athletic administrators at conferences. He also has spoken to groups of parents and school faculty. He recently launched a website, fitchtalks.com. He has received so many requests to speak he could probably make it a full-time gig, but his job as a Jostens sales rep, which he has done for 22 years, a coach and, most important, a father keeps him busy. “I’d like to see my kids,” says Fitch, who has a daughter who’s 9 and son who is 6. Jostens trademarked “Pause Before You Post” several years ago before Fitch began doing his speeches. The ring giant has a dedicated social media spot on its website. “It’s nice because you have a national company that will put millions of dollars into some of these educational, add-on pieces,” says Fitch, a five-time Monroe County and two-time All-Greater Rochester Coach of the Year who is also an assistant for USA Basketball’s Under-16 national team. What’s the essence of his “Pause” message? “I think if you step back a second and don’t (post) when you’re emotional, you tend to save yourself a lot of harm,” Fitch says. Social media isn’t all bad, though. “This isn’t a bash social media session,” Fitch tells his groups. He marvels at being able to connect in seconds via Twitter with a coach overseas if he needs to know more about a player. He also tells the Bay Trail group how “cool it is,” that when they start high school next year they can “brand themselves” like no other generation before them, and use social media to show others the good things they do. Fitch details how for Jostens he’ll also have to hire people. He shifts gears again, casting a serious tone as he begins to talk about cyberbullying, a topic he hears so much about that he admits he once “checked out on,” when he listened to a speech about it. “But it’s real and it’s still going on,” he says. Fitch shares another story about the night 14 months ago when he missed a game because the sister of one of his players made an irreversible decision. He never mentions exactly what happened, but it’s evident the young woman took her own life. A couple days later, he got online and tried to find out what impacted the girl so much to go down that dark road. “I wanted to see it. I wanted to see what it looks like,” Fitch says about cyberbullying. What he saw didn’t look all that bad to him, Fitch tells the students. “But you know what? I don’t make that decision. You don’t know what someone else is going through or feeling when they read that post,” he says, lowering the microphone so he can raise his voice loudly. Buddington, the Bay Trail principal, says Fitch’s message arrives at a perfect time for junior-high students because they’re just learning that social media expands their world well beyond what they’ve been used to as youngsters. “It’s really important to help them develop those skills,” Buddington says. Is educating young people about social media helping? Fitch says it’s tough to measure.